Posted June 6, 2013 & filed under Blog. Drought and pumping has New Mexican well owners facing limits on water use from their own private wells, according to an article in the Santa Fe New Mexican. And they don’t like it. [Residents] are protesting the permanent limits proposed by the State Engineer’s Office on the amount of water they can use from their private wells. They claim their well permits represent a valuable property right, and that the state is trying to take those rights. The state says under the law, the state engineer can reduce water rights unless a well owner can prove they are using more. It’s as if everyone is guessing. We’d like to see models and policy agreements supported with holistic groundwater information, actual data and trends, that includes supply (available and recovering) and demand. 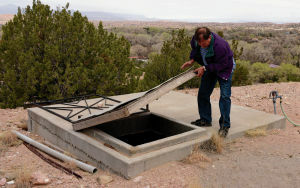 Clearly, nobody, the state or the well owner, wants the aquifer to run dry. Groundwater sustainability isn’t possible without facts and transparency. It’s time to stop guessing and find out what’s going on down there. Wellntel can help. Posted May 20, 2013 & filed under Blog. Since the pivot [irrigation systems’] debut some six decades ago, the amount of irrigated cropland in Kansas has grown to nearly three million acres, from a mere 250,000 in 1950. But the pivot irrigators’ thirst for water — hundreds and sometimes thousands of gallons a minute — has sent much of the aquifer on a relentless decline. And while the big pivots have become much more efficient, a University of California study earlier this year concluded that Kansas farmers were using some of their water savings to expand irrigation or grow thirstier crops, not to reduce consumption. At an average 14 inches per acre in a growing season, a corn crop soaks up groundwater like a sponge — in 2010, the State Agriculture Department said, enough to fill a space a mile square and nearly 2,100 feet high. The USGS provided the groundwater map of the region for the story. Posted May 16, 2013 & filed under Blog. Wellntel is mentioned as part of a smart water conservation strategy for rural homeowners in this month’s Acreage Life Magazine. Check it out online, on page 15. Posted May 16, 2013 & filed under In the News. Wellntel CEO Marian Singer is featured on “WisBusiness: The Show” this week, answering questions about the need, the solution and the impact of better groundwater information. Her interview begins at 4:37. If you talk with people (homeowners and farmers) in water stressed regions (60% of US), they’ll tell you that groundwater is property value. Posted May 13, 2013 & filed under Blog. Groundwater withdrawals in the United States have increased dramatically during the 20th century—more than doubling from 1950 through 1975. 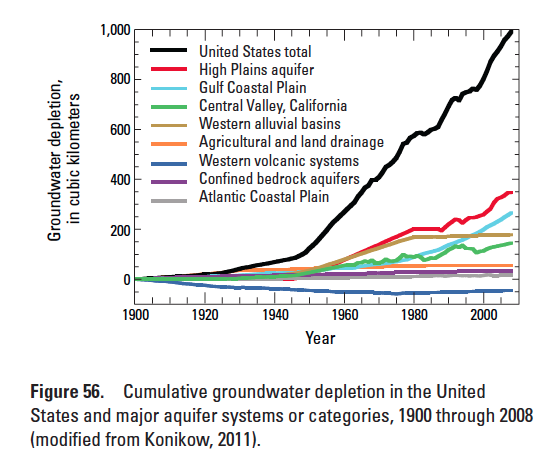 Groundwater depletion is the inevitable and natural consequence of withdrawing water from an aquifer. Although groundwater depletion is rarely assessed and poorly documented, it is becoming recognized as an increasingly serious global problem that threatens sustainability of water supplies. The complete report is here: http://pubs.usgs.gov/sir/2013/5079/SIR2013-5079.pdf. Posted April 23, 2013 & filed under Blog. We’re speaking on Monday, April 29, 2013: 04:20PM – 05:40PM, at the Hyatt Regency San Antonio, Regency East 2. Posted April 19, 2013 & filed under Blog. Central Valley Business Times is reporting on a new developing in publicly shared infomration about water resource. The first-ever public “California Water Rights Atlas,” designed to enables citizens, policymakers, media and others to view thousands of current California water rights claims via the Internet is being unveiled Friday by former Brown Administration Resources Secretary Huey Johnson, president of the Resource Renewal Institute. RRI is a nonprofit, public interest organization. It says it is providing the information to the people of California free of charge. The Water Rights Atlas addresses California’s water crisis by opening, organizing, and distilling “dysfunctional state-level data to improve efficiency and access for water resource managers and the public,” the institute says. Or open the Atlas, here. http://ca.statewater.org/water-rights. Posted March 6, 2013 & filed under Blog. A Texas lawmaker has introduced a bill that would help the state keep better track of how much water it’s using. State Senator Kel Seliger, R-Amarillo, has filed a bill, SB 272, requiring most farmers to report their water usage to the Texas Water Development Board. Most of the water in Texas is used for farming and ranching, 56 percent of it. And much of that water comes from sources underground. So water planners need to understand how much is being used from those resources they can’t necessarily see. 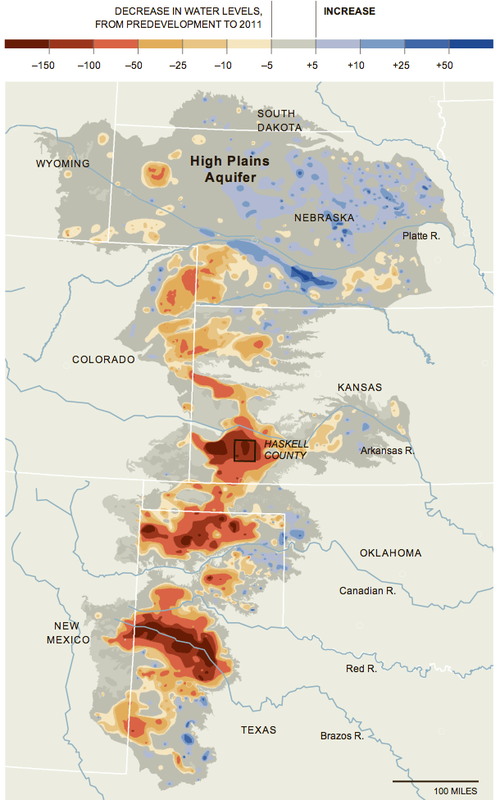 The Ogallala Aquifer in the Texas Panhandle, for instance, experienced its largest drop in 25 years in 2011. Read the full story at StateImpact. Posted February 25, 2013 & filed under Blog. Minnesota’s Star Tribune is reporting that the water cycle in the Twin Cities area is far out of balance with withdrawals surpassing the rate of recharge. Experts are predicting that unsustainable consumption will force farmers and residents to go elsewhere. The state’s DNR is starting to tackle in the problem. [Minnesota] DNR water officials say it’s time for local communities to start making decisions on water, rather than the state, because the current rates of use are not sustainable. “If you fail to make a choice, then at some point the aquifer will do that for you,” said Jason Moeckel, a water manager for the DNR.This year the DNR will ask one or two water-strapped communities to bring in their biggest water users — cities, farmers, ethanol plants and others — to negotiate conflicts among themselves. It’s never been done in Minnesota, and though many may like the idea of “local control,” the reality may be much more contentious, officials say.“Everyone likes [it] until they have to be a bad guy to their neighbor,” said Jim Sehl, a DNR water manager. “That’s going to be the toughest selling point — getting people to accept responsibility for making those tough decisions. ”Such choices may come as a shock to to Minnesotans’ assumptions about water, said Deborah Swackhamer, co-director of the Water Resources Center at the University of Minnesota. Elsewhere in the country per-capita water use is declining, but not in the Land of 10,000 Lakes. That, she said, could require hard adjustments. Higher prices for water could result, or more water recycling, or the controversial idea of allowing cities to re-inject treated water back into aquifers. via Minnesota draining its supplies of water | StarTribune.com. Posted January 30, 2013 & filed under Blog. While aquifers occur at varying depths, it’s traditionally been the shallow aquifers (generally 500 feet or less) that populations have tapped for drinking water, irrigation and commercial activity because of the relative ease and low cost associated. However, in places like Mexico City, where population and changing weather patterns have overburdened shallow aquifers and made recharge difficult or insufficient, deeper aquifers are getting a second look. 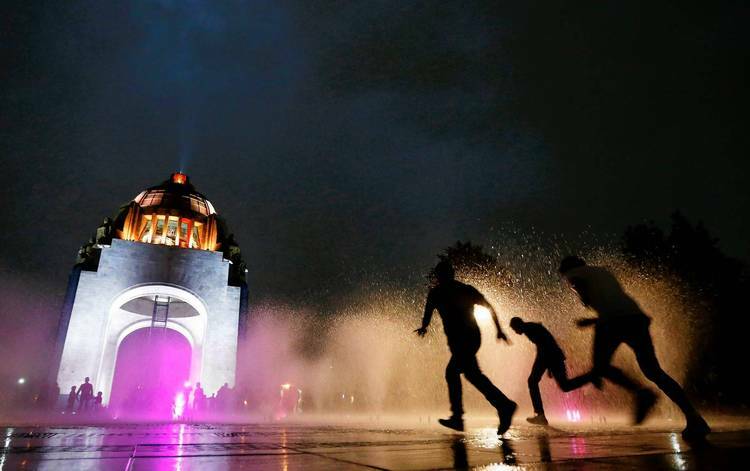 In a front-page article Monday in the newspaper Reforma bearing the fevered headline “Water in Sight!” the director of the city water system, Ramon Aguirre, described the discovery as “one of the biggest historical successes for the city.” He said the aquifer was capable of supplying water for more than 100 years. Aguirre said he expected the city to initially drill five wells to draw water from the aquifer, a project that could cost about $40 million. The challenge with deep water aquifers has always been one of economics. The cost of drilling the wells and powering the pumps as well as the likely additional cost of treating the water have combined to make deep water aquifers unattractive. However, with few alternatives and burgeoning populations, we anticipate that more cities like Mexico City will look to deep aquifers as a critical water source.